It is necessary to prepare a good day trading strategy to be able to make money by online electronic daytrading. Testing is an important part in the process of creating any profitable intra-day trading strategy. Every market strategy must be tested before it can be used as part of a profitable daytrading system. This testing can be done by day trading simulation or by doing virtual stock trades. Do you plan to trade one stock or multiple stocks in your strategies? The first issue we have to know is specification if our online electronic day trading will use only one or fa ew firmly preselected instruments. Do you plan to trade one stock like some index ETF like SPY or QQQ or any particular ticker suitable for daytrading? Another option is that our strategies will trade stocks that will be selected discretionarily or by some market screener and the list of these stocks could be different every day or week. When we plan to trade only one instrument then there are more options for testing. Qualities of our strategies could be tested by backtesting and also by other methods described below. Backtesting is based on the principle that we can check if our online stock trades worked in the past. If our trades are based on some formula that can be defined, then it is possible to define strict rules for entries and exits. These rules could be put into some software – automatic day trading simulator. This type of simulator must have enough data about price movements in the past. If we want to backtest daytrading strategy then the simulator must also have historical intraday data in its database. Then we define the period for testing purposes, first and last day, and run the test. The day trading simulator goes through the defined period, applies our rules to price and simulates trades. Results are recorded and published after the simulation finishes. Different software packages have different types of simulation integrated. There is a very good backtesting function in Amibroker, the analysis software. 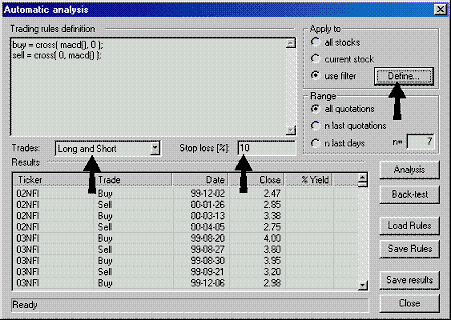 Here is an example of AmiBroker’s analysis window. Another good option is Esignal with its Strategy Analyzer. The eSignal Strategy Analyzer has six tabbed sections and more than 250 values useful for strategy performance analysis. Multiple modes of graph presentation and the ability to create personal settings for displaying the values of the report and analyzing the strategy make it ideal for customizing the strategy to meet your individual needs. Visually enhanced graphs and added functionality make back testing and strategy adjustments easy to accomplish. Another option for testing any daytrading rules is to do virtual trades. Such virtual trade is done manually by personal monitoring of price and decision that all rules are fulfilled and trade can be executed (entry or exit). It is possible to use historical data available in testing/charting software and use a feature like Bar Replay. With this feature, you can step through your trading day bar-by-bar to assess your strategies and adjust accordingly. This feature is available in AmiBroker and also in Esignal. Data about any virtual trade could be recorded manually by writing into Excel or similar spreadsheet software. It is also possible to open some paper trading account for day trading simulation. Then all trades are done in this day trading simulator and every virtual trade is recorded automatically. When the testing period finishes we have to download recorded data about virtual stock trades into some good journal software where this data can be analyzed. It is also possible to test any stock day trading strategy using real time data. To use current day and coming days and make virtual trades in a daytrading simulator when needed by using your daytrading rules. Again we have to record data manually or automatically with trading journal software and make an evaluation. This real time strategy testing is also important to do after previous backtesting as the next step before live trading with real money.